You need a 9 or 10-inch tinned-steel tart pan with a removable bottom, like the one shown below. It needs to be sprayed with nonstick cooking spray. 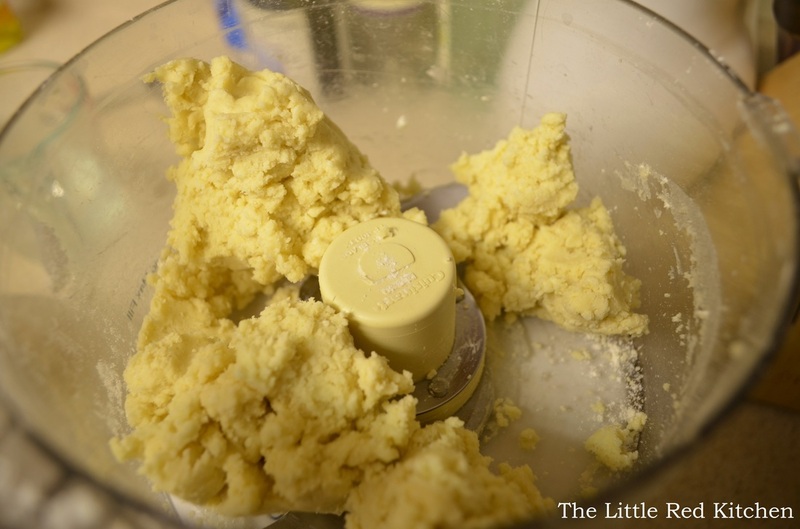 For the tart shell, place the flour, salt, and sugar into your food processor fitted with the steel blade and pulse just a few times to combine. 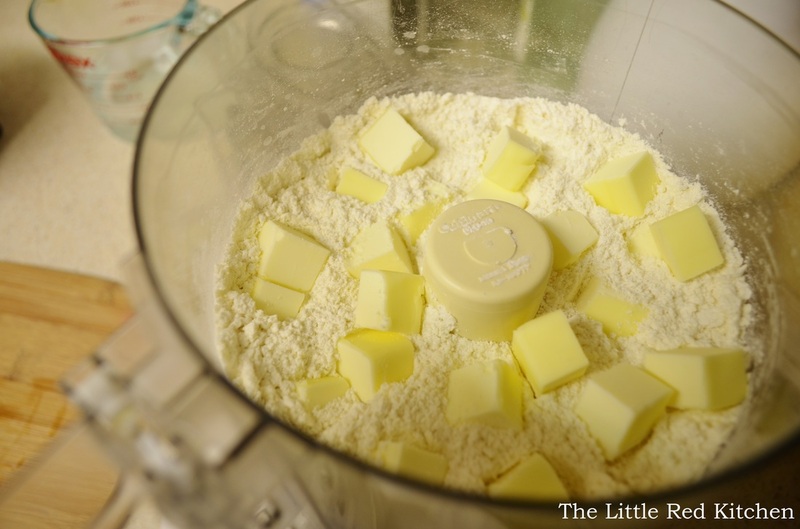 Then place the butter pieces on top and process until the mixture resembles course sand, about 15 1-second pulses. Pour in 2 tbsp. 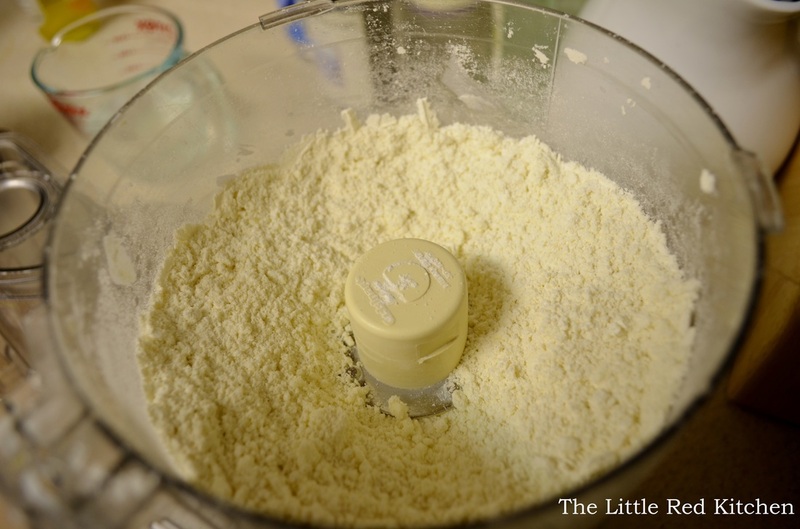 of ice water and process until the dough starts to come together into clumps and there is no dry flour left in the bowl. If this hasn’t happened after about 5-10 seconds, add the other tbsp. of water. 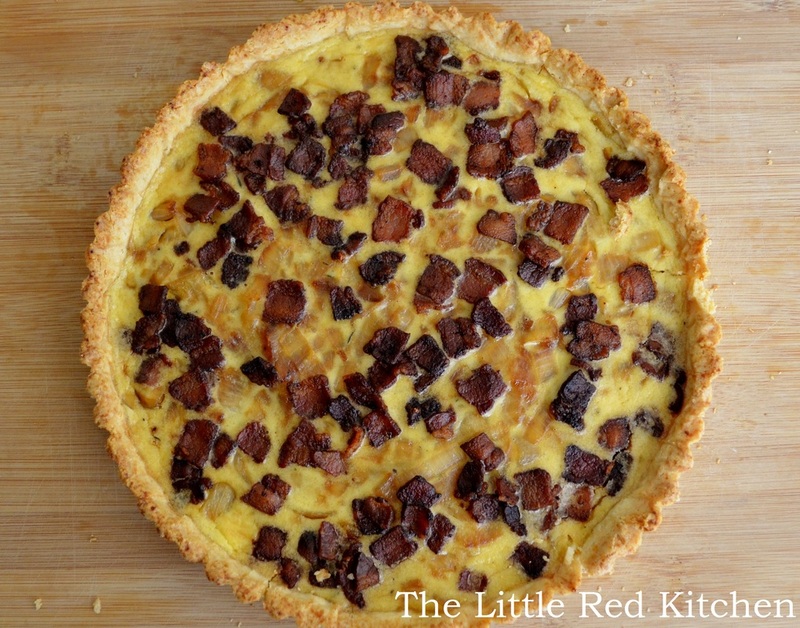 Dump this mixture into your greased tart shell, breaking it up into large, walnut-sized pieces. then begin patting them out in the pan, working from the center out. This dough is really easy to work with, just take your time. Once you’ve reached the edge of the pan, use the heel of your hand to start smoothing out the surface, and pushing the dough up the edges of the pan, into the fluted walls. 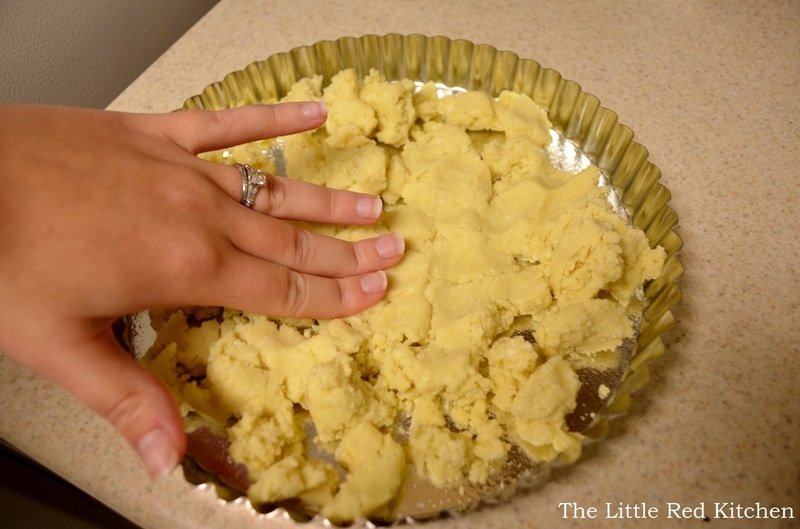 As you can see in the above picture, you’ll have some places where the dough sticks up over the top. 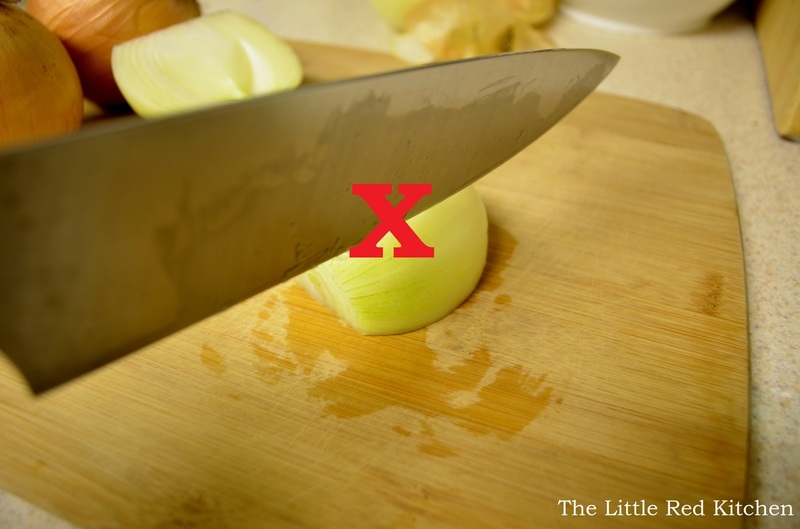 Use your thumb or fingers to level it off, then use that extra dough to patch up any spots that seem thin. After you have finished prepping, pre-heat the oven to 375 degrees, with the oven rack in the middle of the oven. 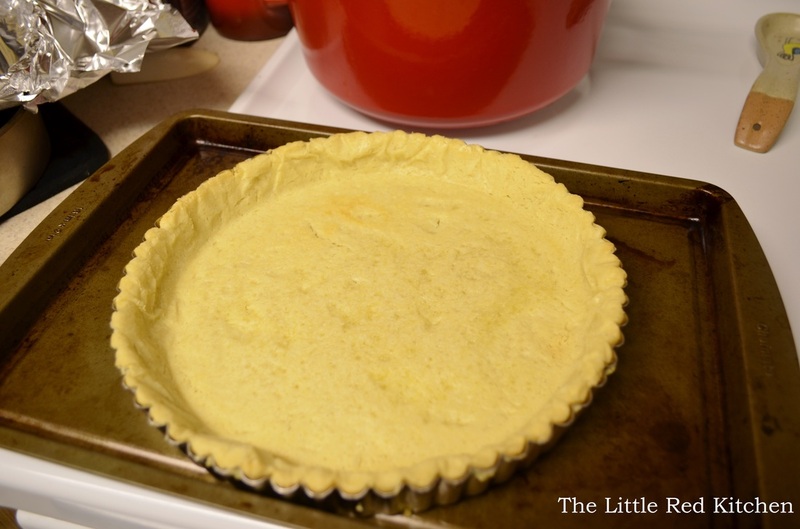 When the tart shell’s 30 minutes are up in the freezer, take it out, remove the plastic wrap, and place it on a baking sheet. 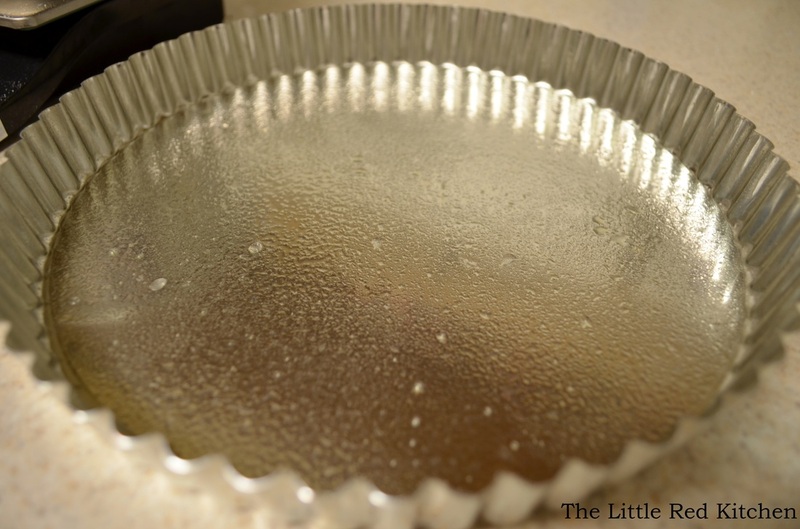 Spray a large piece of aluminum foil with cooking spray and fit it onto the tart shell. Fill the shell with pie weights. Oh, you don’t have pie weights? Me either! 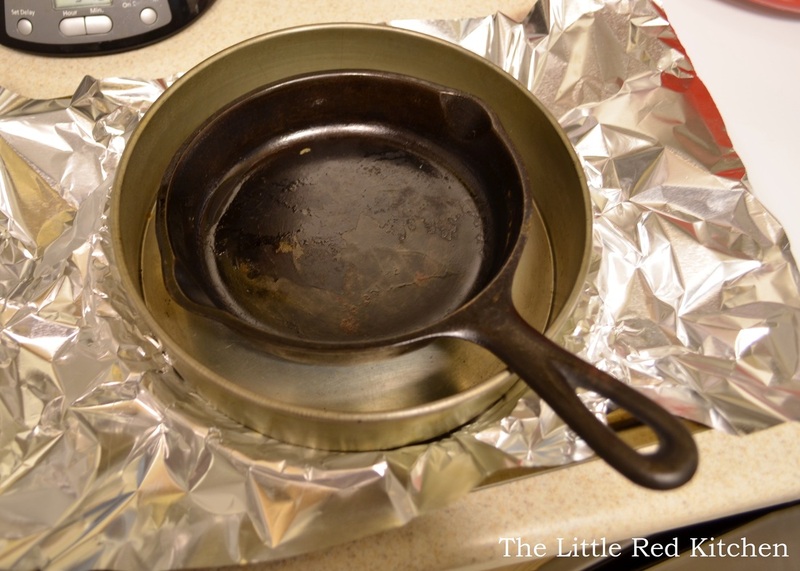 Instead, I used a mini cast-iron skillet inside a cake pan. 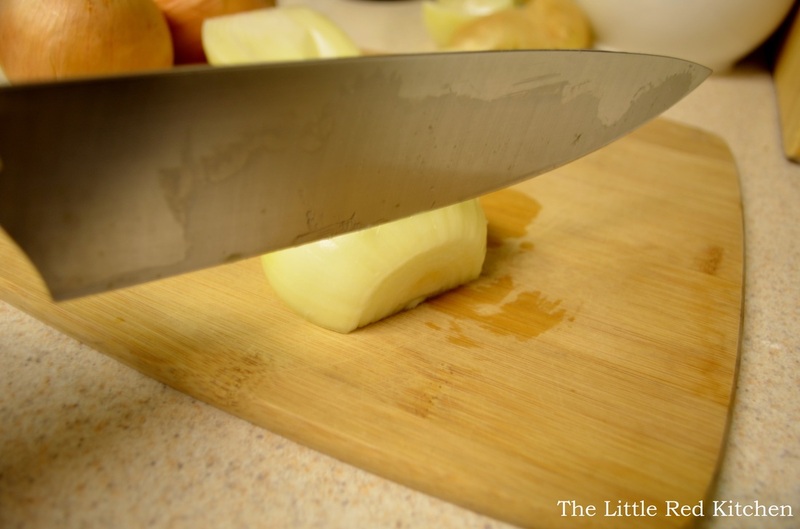 Use whatever you have that is oven safe and will weigh between 2 and 3 pounds. Bake for about 30 minutes; the shell should have started to brown slightly, and the bottom should no longer look wet. 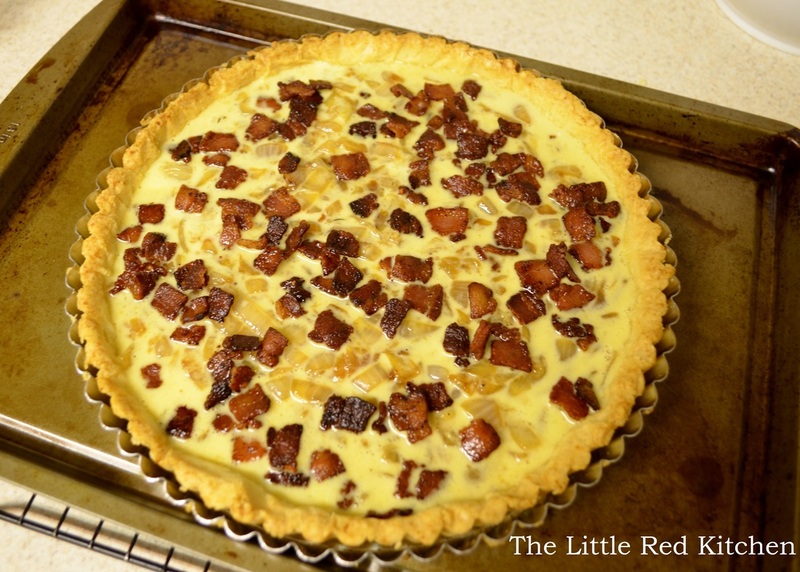 While the tart shell is in the oven, place the bacon in a 12-inch nonstick sauté pan and cook over medium heat for 8-10 minutes, until browned and the fat has rendered. 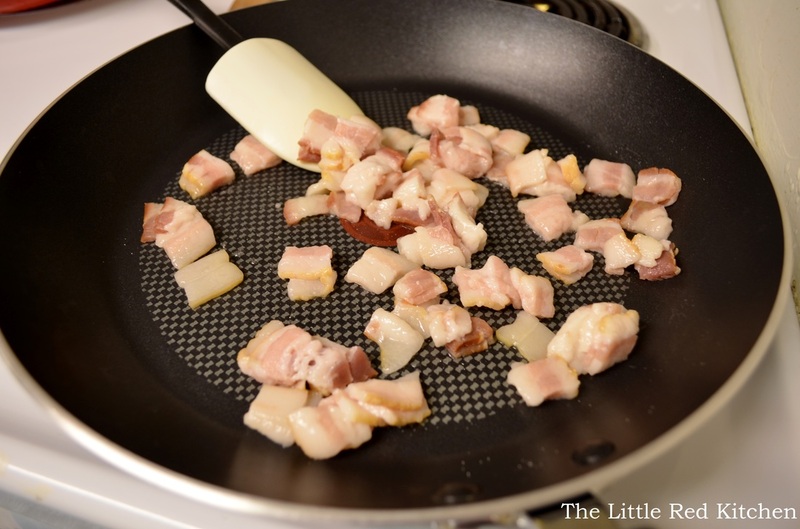 Drain the bacon through a mesh strainer, catching the fat in a small bowl. Put 2 tbsp. of said fat back into the pan and add the onions, salt, and thyme sprig. Cover with a lid and cook over medium heat for 10 minutes until the onions have released some of their liquid, wilted, and started to brown. 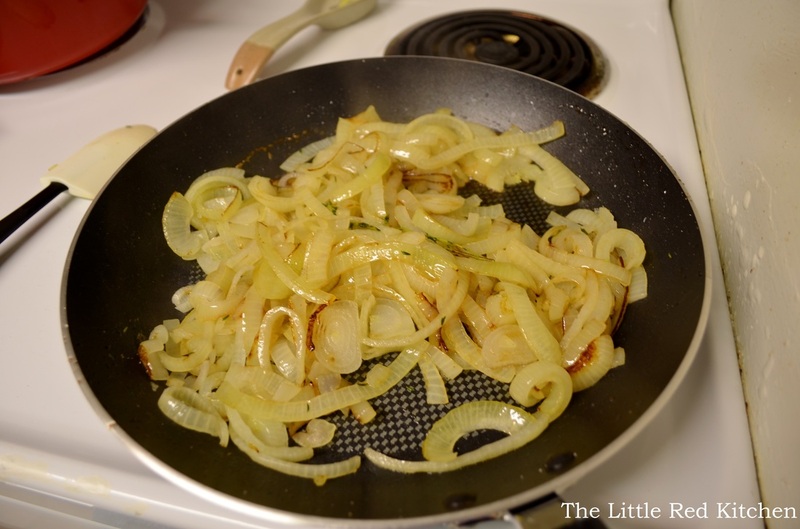 Turn the heat down to low, replace the lid, and cook for 15 minutes; the onions should get really brown and caramelized, aka vegetable candy. Remove the lid and continue to cook for another 5 minutes, so any excess liquid can cook off. Remove the thyme sprig and let sit off the heat for 5 minutes. Now, you are almost there! While the onions are cooling down, in a large bowl combine the eggs, half and half, and pepper. 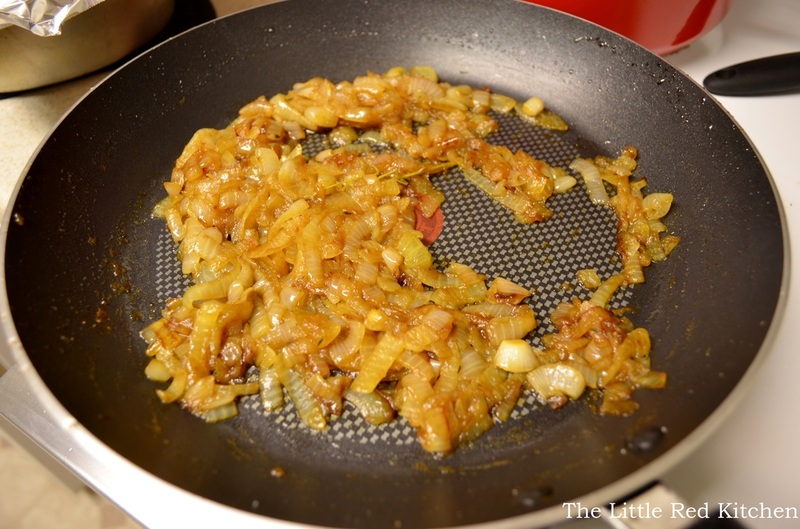 Then dump the onions in and stir to combine, and pour into the tart shell. Sprinkle the bacon on top. 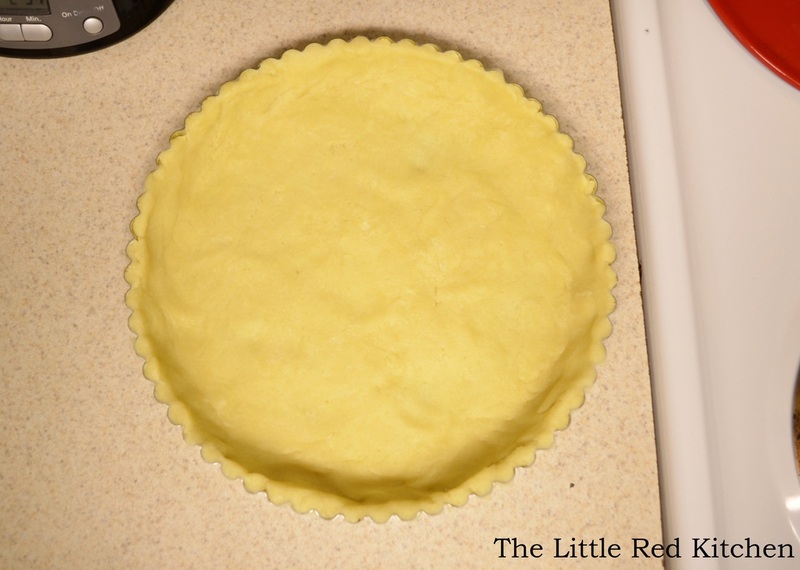 Look how good that looks, and it’s still raw!Bake for 20-25 minutes, until the center of the tart is firmly set. Cool on a wire rack for 10 minutes. 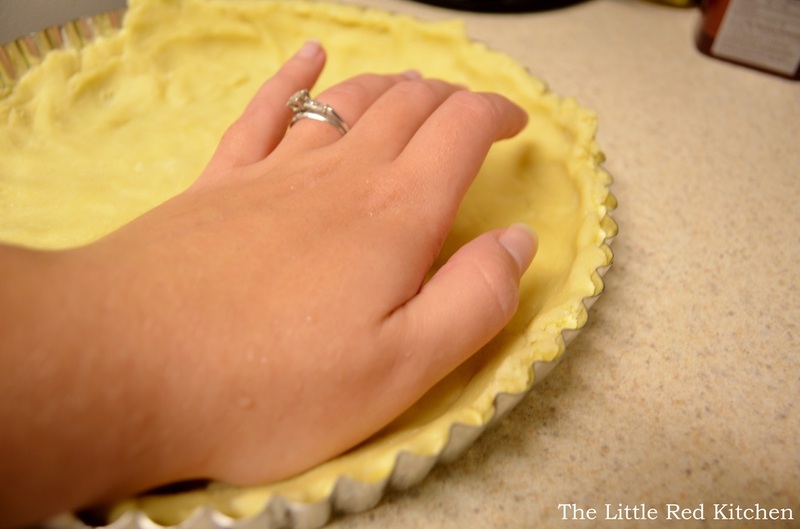 When ready to serve, remove the tart pan ring…there is no easy or masterful way to do this, just get it off there! 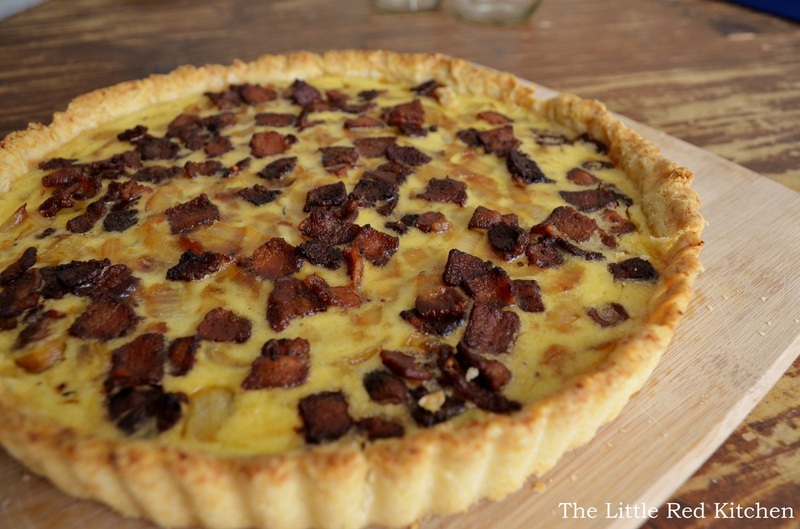 Then I placed the whole tart on a cutting board and used a spatula to slide it off the bottom of the tart pan. Cut into wedges and serve! Sure, this recipe takes a long time to make. 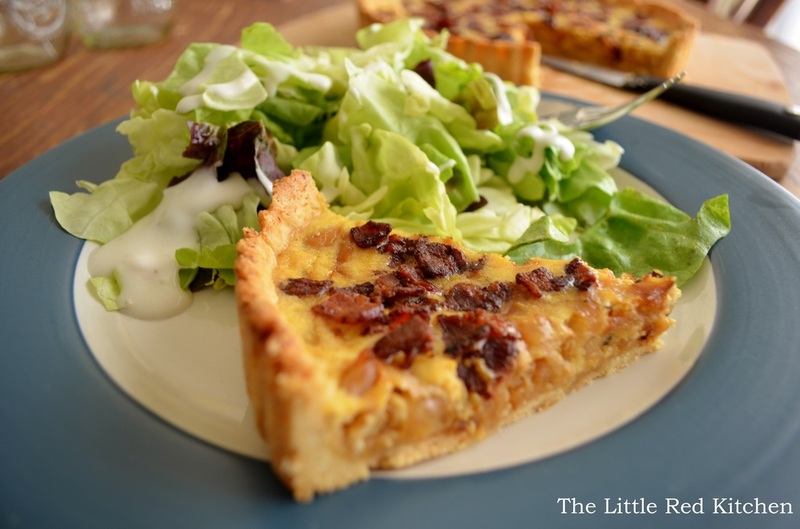 But the good news is, there is never more than 1 active thing going on; while the tart is freezing or baking, you are working on prepping and cooking the filling. And just look at that beauty.